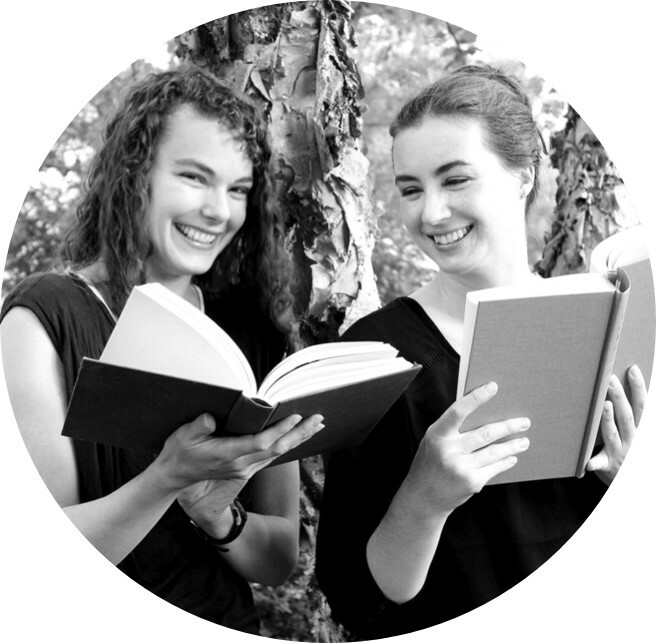 Do you go through phases in your reading where you just want to read a bunch of sequels? I am definitely in a sequels mood right now. I just finished the books in this post. I'm the middle of two more sequels, and I've got four more on hold at the library. I hope this sequels mood lasts! 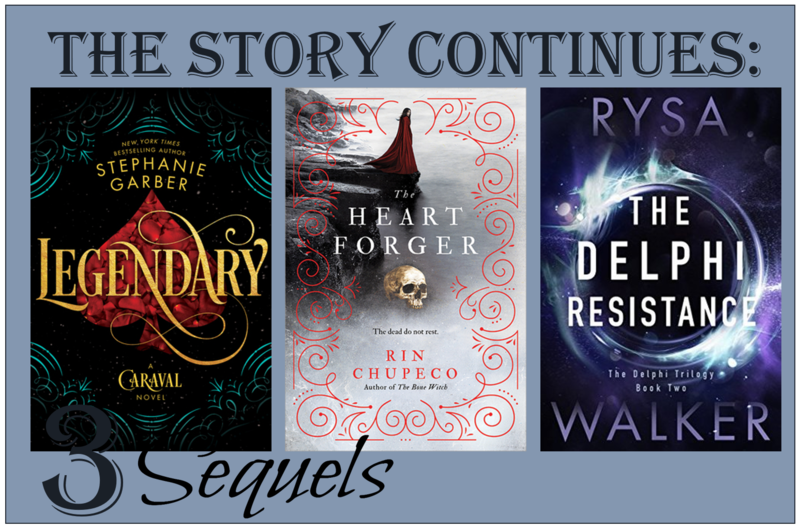 Whether you are in a sequels mood or not, I can tell you that these sequels are perfection. Remember last year when Caraval was one of the most buzzed about YA debuts? Well the sequel is out. (How fast these book series grow.) And I loved it even more than the first. Caraval is a little difficult to describe. The closest I can come to a explanation is that it is a carnival or circus-type setting that features a high-stakes game. Caraval only takes place at night; it involves magic and mystery, and players must solve a series of clues. I love the magic of Caraval. The dreamlike setting makes the players and the readers alike question what is real and what is not. Legendary begins where the events of Caraval left off. Scarlett and Donatella are now free of their father's clutches, and they travel with Caraval to the capital city where Legend, whose identity is still a mystery, is putting on a special edition of Caraval in honor of Empress Elantine's birthday. Tella is forced to play the game so that she can uncover the information she owes a mysterious benefactor. Tella, of course, has her own secret goals, as does Legend. This puts Legend, the benefactor, and Tella at odds with one another. And Tella is further hampered because she doesn't know who Legend is. Ooh. I loved this sequel so much. Tella is such a fun character, and I loved reading her story. Scarlett is great as well, but I think of the two sisters it's Tella who has won me over. I love how lively and determined she is. Also, the mystery in this book was tops. 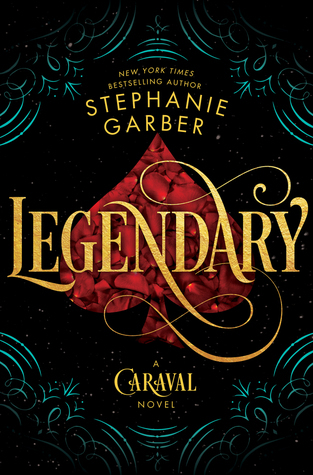 Caraval felt high stakes, but Stephanie Garber has upped those stakes even more in this addition to the series. The capital city setting is full of creepy shops, beautiful palaces, and mystical temples. Stephanie Garber also adds to the mythology of her world. The Fates are intriguing and pretty frightening. I'm so glad the series isn't over yet. I'm putting Finale on my highly anticipated list for certain. 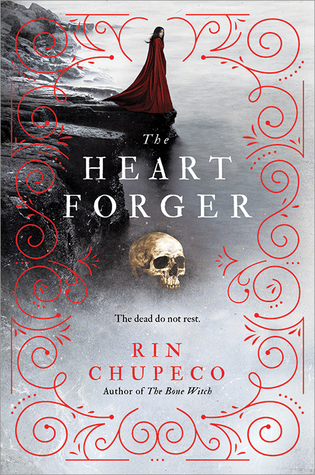 Last year I read and reviewed the first book, The Bone Witch, in Rin Chupeco's new fantasy series. Tea, can raise beings from the dead. The first book is about Tea's emerging powers, her training with a more experienced necromancer, and her friendships and rivalries. The book is set up as a story within a story, so the reader gets glimpses of a more powerful Tea recounting her tale, which definitely piqued my interest. The imagery in this series is absolutely stunning. It has a bit of an Asian-inspiration, but it's also so clearly it's own world. The writing is gorgeous, and I think what really sells me is the atmosphere. I just love a book that's thick with atmosphere. A lot of the creepiness (you know it has to be in there; Tea raises the dead and can control monsters) is created through atmosphere alone. The Bone Witch is a very intricate fantasy series, and I really wished that the first book was fresher in my mind when I started to read the second in the series. It's so carefully crafted, and I wanted so badly to have all the details of the earlier book at my fingertips so that I could really appreciate that. I also definitely do not fully understand how this world works. I'm not sure that I'm supposed to know, and, even if I am, I don't care because I'm so sold on the writing and the plot and the characters. This is a series that will made you work. It takes a bit of an effort to remember all the place names and character names. And I felt like I had to work a little harder because I listened to the audiobook. It took me a while to get a handle on the jumps back and forth in time and to get all the names of the secondary characters straight again. (There are quite a few names that sound similar Kalen and Khalad and Kance, for instance.) But the series is so good and the narration so beautiful that I don't mind the extra effort. About halfway through the book things start to get really exciting and interesting in both timelines, and the ending is intense. I wish I could read the final book in the series, Shadowglass, right now. I'm a huge fan of Rysa Walker's Chronos Files Trilogy. Last year I read the first book in her new series, The Delphi Trilogy. Every October I like to read some spooky tales, and this story about a girl who picks up and shares her mind-space with ghosts would definitely fit the bill. This series strikes me as a bit darker than Ms. Walker's Chronos Files, and that is saying something because Saul was pretty awful. In the first book in the series Anna teams up with two brothers and a sister with similar paranormal powers and the three of them get us knee-deep into a government conspiracy. In the second book Anna, Aaron, Deo, and Taylor are on the road looking for other gifted children. No one knows that Anna is carrying Aaron and Taylor's brother, Daniel, who is in a coma, in her head because Daniel doesn't want his siblings to know that he might be dead. Sharing her headspace with Daniel and Jayden makes for some interesting side effects. Anna can also use their gifts, and Jayden's clairvoyance plays a major role in the story. Ms. Walker's stories are so action-packed. I can't believe how much ground we covered in this story. And I don't just mean that the characters drove a lot. The clairvoyance was a really cool plot device. The characters in this trilogy are definitely growing on me. I especially came to like Anna's hitchhikers. Ms. Walker leaves us with another painful cliffhanger. 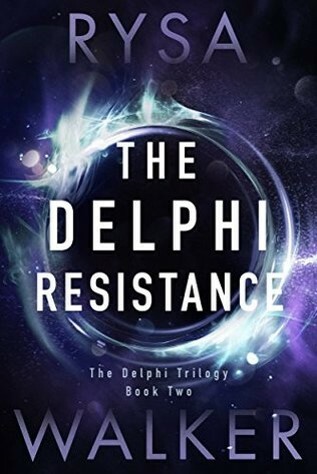 I'll definitely be back for the next book, The Delphi Revolution.